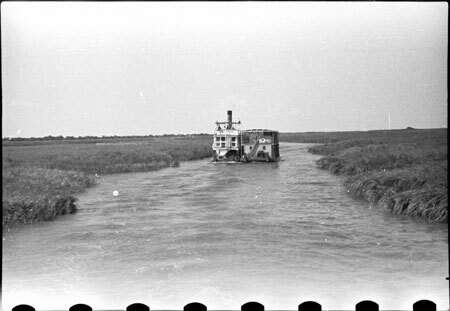 The paddle-steamer Kereri on the Nile. Lashed alongside the steamer to the right is a two-deck barge used for transportation of goods, cattle etc. The Kereri was the mobile district headquarters for colonial officials in Western Nuerland. Morton, Chris. "Western Nuerland steamer" Southern Sudan Project (in development). 03 Jan. 2006. Pitt Rivers Museum. <http://southernsudan.prm.ox.ac.uk/details/2004.130.36022.1/>.